The weather pattern will be shifting to a warm and humid pattern with wetter than normal conditions going into June 2015. Temperatures the next 4 weeks will average a few degrees above normal. The maximum temperatures will likely be to close to normal but with increased humidity and cloud cover minimum temperatures will be held up. This will result in overall temperatures being above normal. This will also result in increased dew overnight into the morning hours for extended periods. The risk for significant 90+ degree days will be REDUCED with more cloud cover, rain chances and higher humidity. Rain chances will be above normal the next 3-4 weeks as a southwest flow above the ground will promote a flow of moisture from the Gulf of Mexico. 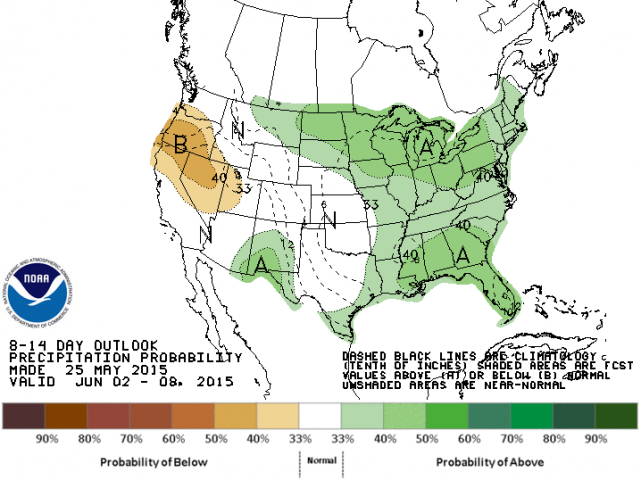 Rainfall patterns will be scattered as are common in the warm season but overall rainfall will be at or above average. Normal rainfall is between 0.75 inches to just under 1 inch per week.